Please use the surf lesson reservations calendar below to reserve your lesson. Just click below on the date and then select the surf lesson type you want to sign up for (private or semi-private) and complete the easy-to-use online form and payment process. All reservations booked online or over the phone receive an email confirmation with surf lesson details. For detailed information about the BigFoot Surf School progression, lesson types and pricing please visit our Lessons page. For questions about preparing for your lesson please see our FAQ’s page. All students, and guardians of participating students, prior to enrollment and participation in the BigFoot Surf School*, (referred to herein and after in this document as BFSS) MUST first read, then complete (either by printed form or accepting the terms and conditions in our on-line reservations store) the following Indemnity and Acknowledgement Agreement. I, agree to assume all risks incidental to participation in: (Student Name) surfing, water sports, and related activities associated with the BFSS. I hereby grant permission for myself or my child (ages 7 – 13) to attend the BFSS. I hereby release BFSS from any and all liabilities, claims, actions, damages, costs, and/or expenses, arising from or in any way connected with my participation in all surf school related activities conducted by BFSS. I hereby agree that BFSS, employees, and affiliates (WA State Parks), are not responsible or liable for any injuries or damage resulting from my participation in any BFSS activities. I understand and acknowledge that surfing and other water sports and related activities are inherently dangerous activities. I acknowledge and assume any and all risk associated with the presence of any and all sea life that may be in the water or on the beach. I assume the entire responsibility of the performance of the activities associated with this agreement. I further expressly agree to indemnify and hold harmless BFSS, and Digital Tide Media LLC., their directors, officers, employees, affiliate companies, and WA State Parks for any and all claims for injury to persons or damage to property or any other damages or losses by anyone, all of the foregoing to include all expenses and charges including attorney’s fees, which may arise out of, or in connection with, the activities associated with this agreement, or which are alleged to have arisen out of activity associated with this agreement. Right To Photograph: By signing this agreement I hereby give my consent and approval to the BFSS & WA State Parks that they shall have the rights, without obtaining my further approval, to photograph, take motion pictures of, televise, or reproduce in any manner or through any media, images of myself, my child, and my legal guardians. BFSS & WA State Parks shall have the right to, display, use, sell or license any such pictures or other reproductions for any purposes commercial or otherwise without monetary compensation to myself, my child or my legal guardian. I hereby authorize any BFSS personnel to conduct any minor Medical First Aid that may be required for my child or myself. I hereby authorize any Physician, Nurses or Emergency Medical Technicians selected by BFSS or WA State Parks personnel to order and conduct medical or surgical procedures deemed necessary for myself or my child in an emergency situation. I understand that I will be responsible for all Medical, Emergency Services, Hospital, Laboratory, and Doctor Fees. I verify that I am in good health and am fully capable of participating in any and all strenuous activities associated with any BFSS activities. I fully understand that each participant must be a competent swimmer and acknowledge that I am a competent swimmer. 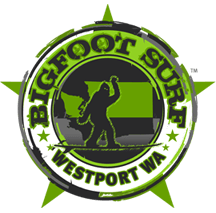 I also hereby agree that by signing this form, that all parts of the Registration and Indemnity Agreement are valid and binding from the date of signature to any and all future dates in which I participate in any and all activities at the BigFoot Surf School in Westhaven State Park, Westport WA. Used under license from BigFoot Surf School & Digital Tide Media LLC. Lesson must be canceled 5 days in advance to receive a refund. Cancellations made at least 5 days prior to the start of the lesson will result in a $20 refund fee. The $20 refund fee can go towards a future lesson. Any lesson canceled with fewer than 5 days until the start of the lesson is not able to be refunded, and will result in the full charge of the lesson fee. No charges for lessons rebooked 5 days in advance. Rebookings made at least 5 days prior to the start of the lesson will result in a $20 rebooking fee. If Big Foot Surf cancels a lesson for any reason that does not fall under the “Big Foot Surf Weather and Drug Use Policy”, the cost of the lesson will be refunded. Big Foot Surf Weather Policy: Westport is in the PNW, which means that from time-to-time we have been known to get some rain. Frankly, this is fine by us since some of the best surfing conditions happen with some liquid sunshine. But remember, our main priority is to make sure that we all stay safe on the water. It is with this in mind that we retain the right to cancel a lesson if the conditions are too dangerous, or if there is lightening. If a lesson is canceled by Big Foot Surf based on weather, we will reschedule your lesson for a future date. To wrap it up, if it’s just rain, the lesson’s going out–since you were planning on getting wet anyways. Drug Use Policy: If it is deemed that a student may be inhibited or under the influence of drugs or alcohol, the student will not be able to attend the lesson and will not receive a refund. Due to the nature of surfing and the physical and mental demands we do not advise surfing under the influence of drugs or alcohol.